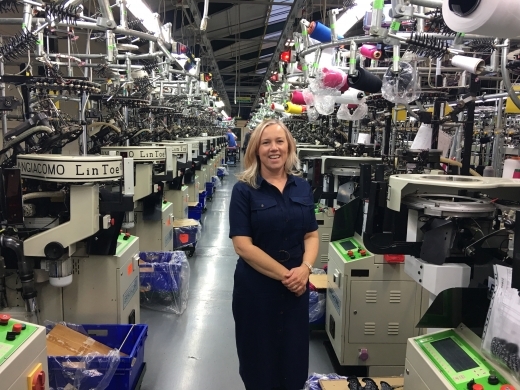 Kate Hills, founder and CEO of Make it British, appeared live on BBC1 Breakfast Business News to announce details of a survey carried out by Make it British, which reveals that 45% of UK textile manufacturers say business is better than last year. While the fashion manufacturing industry in the UK faces many challenges in the current economic climate, the Make it British survey shows that business is booming with many manufacturers reporting increases in production of 25-50% compared to 2015. Of the 95 UK textile manufacturers taking part in the survey, 30% said they were receiving more enquiries now than prior to the EU Referendum, but that they were being hit by rising costs for raw materials, many of which are imported from the EU. Around half (47%) said that finding skilled staff was the biggest barrier to further growth while 39% blamed lack of support from Government. When asked: ‘How positive do you feel about the future of UK textile manufacturing?’ the answer was an average of 3.75 on a scale of 1 to 5. The programme was broadcast live from John Smedley, the oldest manufacturing factory in the world. Kate appeared alongside Ian Maclean, Managing Director of John Smedley and Mick Cheema from Leicester garment manufacturer Basic Premier. Founded in 2011, Make it British is the go-to resource for information on UK manufacturing and British-made brands. Make it British believe that a product’s provenance is of the utmost importance. By buying authentic British goods, manufactured by skilled craftsman using the finest materials, you are helping to keep these skills alive in the UK. If you don’t support those makers in Britain that still have these precious skills, you will lose them forever.